Fr Christopher Columbanus McKeogh SMA died peacefully at 8.10am on Thursday, 2 June 2011 in St Theresa’s, African Missions, Blackrock Road. He was 76 years of age and had been in declining health for some years. Fr McKeogh was born in Parkstown, Ballivor, Co Meath on 16 November 1934 to James and Lena McKeogh (née McLoughlin). He was the last born of five. His three brothers, Patrick, John and James and a sister Ailish all predeceased him. His local parish church was dedicated to St Columbanus and he was given this as a second name at his baptism on 18 November 1934. Within the SMA he was always known as Colum. He attended Ballivor National School and then moved to the CBS in Trim for his secondary education (1948 – 1953). After completing his Leaving Certificate, Colum entered the African Missions Novitiate in Kilcolgan, Co Galway. Having reached the required standard for a University degree, Colum was sent to the African Missions College in Wilton, Cork from where he attended the University College, studying Latin, Geography and Philosophy. After attaining a BA in 1958 he completed his theological studies in the African Missions Major seminary in Dromantine, Newry, Co Down. He became a temporary member of the Society on 26 June 1955. On 13 June 1961 he took his oath as a permanent member of the Society and was ordained on 10 December that year, one of a class of sixteen priests. It was the tradition that Ordinations took place in St Colman’s Cathedral, Newry. But this was not the case with the 1961 Ordination class. At that time Fr John J Conlon, the Superior in Dromantine, had encouraged the BBC to do some Radio broadcasts of ceremonies from Dromantine. It was a means of getting the SMA known by people far beyond Co Down. In 1961 the BBC decided that they would televise the Ordinations. However, due to lighting issues, St Colman’s Cathedral was considered unsuitable for a TV production. It was agreed with Bishop Eugene O’Doherty that the ceremony be moved to St Peter’s Church, Lurgan. During his seminary years Colum was a keen debater and diligent at his studies. Though not noted for his sporting prowess, he had a lifelong interest in sport, particularly the exploits of the Meath team. After Ordination he was appointed to Benin City diocese, Nigeria, along with a classmate, Fr Tom Hassett. After completing their Tyrocinium (learning the language and customs of the people) they were given their first appointments as priests. Colum was to join the teaching staff of the Immaculate Conception College, Benin City. Without fear of contradiction, Colum McKeogh was an excellent English teacher. After one year he was transferred to Annunciation College, Irrua where he was a valued staff member and, eventually, became Principal succeeding Fr Aidan Anglin SMA in 1968. Fr Jim Higgins, in his book Kindling the Fire, gave a resume of Fr Colum’s ministry in Nigeria (pp 108-109): “Colum was actually the last of many illustrious (SMA) Principals who served there. … During this period they had the assistance of many lay missionaries, mainly young graduate teachers from Ireland. All of them, together with their Nigerian brothers who were now becoming more numerous, made Annunciation the leading school in Ishan and one of the most renowned in the Mid-West. Colum saw to it that the high standards were maintained and that all students and staff did their duty. Colum, like many other missionaries, experienced the tragedy of the Nigerian Civil War at first hand as the competing forces (Federal and Biafran) passed through Irrua during the conflict. 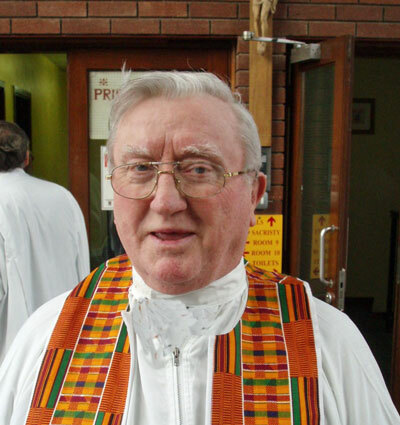 When Colum resigned from teaching in the late 70’s, he took up fulltime pastoral work.” His pastoral appointments included a period as Parish Priest in St John’s, Fugar (and also teaching in its Secondary School) and a period, shortly before he left Nigeria, as Pastor of Annunciation parish, Irrua. “In both places he displayed the same meticulous dedication that he displayed in ACC Irrua bringing these young parishes to greater maturity and helping to make them the flourishing catholic communities that they are today”. One of his tasks in Fugar was to build a house for the priest to live in. After a Sabbatical in 1981-1982, Colum returned to Benin City diocese. In 1984 he was asked to be part of the founding group of SMA missionaries invited by Bishop Hallett CSsR to work in Rustenburg, South Africa. With a classmate, Fr Vincent Brennan, they began their missionary work in St Clement’s parish, Modimong. The SMA had a short-lived mission in the Prefecture Apostolic of Central Cape, South Africa in the 1870’s, more than 100 years before. In 1988 Colum returned finally to Ireland and, after a Sabbatical, was appointed to the Promotion team, travelling all over Leinster collecting funds for the Society’s missionary work. He did this work for fifteen years, based at the SMA House in Maynooth and later in Ranelagh. During those years an increasing loss of hearing made it more and more difficult for Colum to interact with those around him. He never complained but continued to give his all in any task asked of him. His return to Ireland afforded Colum the opportunity to reconnect with his beloved Meath team. And during those years there was hardly a match in Croke Park or other parts involving them that Colum didn’t attend. He could replay matches, pass by pass. Eventually his hearing loss was so acute that he could no longer continue his work and he retired to Blackrock Road in 2006. Despite his deafness and been confined to a wheelchair, Colum lived quietly in St Theresa’s and participated in the community activities as best he could, including the daily Mass at 10.30am. Without doubt, Colum McKeogh will be remembered as a noted educationalist in Nigeria. He was an excellent teacher. He had a wonderful sense of fun and when you saw a glint in his eye it was either that he was letting you know that he was not going to be taken in by you or else he was getting ready to say or do something for a bit of fun, particularly about Meath football. Colum would have celebrated 50 years as a priest this December. He will now do so from his place of rest with the Lord. And probably be praying for his beloved Meath team!